Declaring, “We cannot walk alone,” Martin Luther King Jr. once described his dream that, someday, all our tough-talking cops and their excitable, diminutive brothers-in-law would make that trip together—to ride along in peace and harmony and gun-related slapstick. And so, on this holiday weekend dedicated to preserving MLK’s memory and tacking an extra day onto the box-office receipts, America honored him by making Ride Along the No. 1 movie in the country. From every hillside, let the sound of Kevin Hart shrieking like a little girl ring. 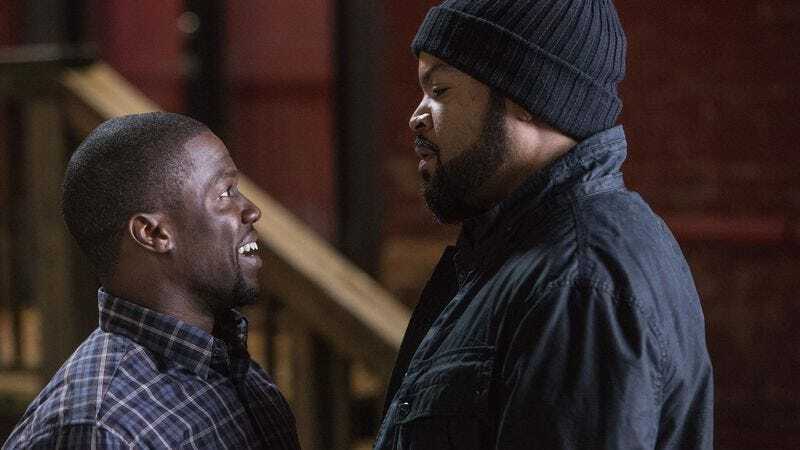 Hart’s buddy-cop comedy with Ice Cube pulled in around $42 million, beating Cloverfield to become the biggest January debut ever (and arguably the loudest). And with audiences giving it the elusive CinemaScore “A” rating, it seems well on its way to getting to the promised land of $100 million for a comedy. You may not get there with Kevin Hart and Ice Cube, but it doesn’t matter: They have each other, and besides, they’re already planning a sequel. The AARP failed in its attempt to similarly rally America’s senior citizens for its first-ever “Movie For Grownups,” Jack Ryan: Shadow Recruit, as most grownups decided that a “rally” sounded exhausting. (Not to mention it’s January out there; what are you, crazy?) That indifference left the attempt to reboot Tom Clancy’s super spy with a fourth-place opening of $17.2 million—a figure that nostalgically recalled The Hunt For Red October in the worst way possible, by matching its 1990-era numbers. With the film seemingly unlikely to turn much of a profit past its $60 million budget, the only person who’s celebrating is likely Ben Affleck, who’s now officially no longer everyone’s least favorite Jack Ryan. The weekend’s other two wide releases, The Nut Job and Devil’s Due, landed in third and seventh place, respectively. For The Nut Job, it’s being hailed as a victory for a non-major-studio animated movie—it beat Coraline to have the biggest opening ever in that category—even as Disney’s Frozen continued to quietly absorb a big chunk of its potential audience down in fifth place. No such qualifiers or excuses for Devil’s Due: Its paltry $8.5 million haul indicates audiences may finally just be over watching movies about demonic possession in January, just as past generations grew weary of roasting chestnuts and wassailing. Meanwhile, Oscar nominations and the general awards season rush gave sizeable bumps to American Hustle, August: Osage County, Gravity, 12 Years A Slave, and Captain Phillips, while great word of mouth (other than this) helped Lone Survivor hang on to second place. And the less prestigious, but no less contentious, race to become the year’s first huge flop continues between 47 Ronin and The Legend Of Hercules, with Renny Harlin’s exploration of the epic myth that Kellan Lutz is a leading man falling by 60 percent in its second week, now landing completely out of the Top 10, while the movie in which Keanu Reeves knows kung fu, again, found itself jettisoned from more than 1,000 theaters—and still about $60 million short of its budget, even taking into account global markets. If only Lutz and Reeves could pair up for a slackjawed ride along, they’d get to that particular mountaintop a whole lot faster.